Les Misérables Theatre Breaks have captured the imagination and enthusiasm of the theatre-going public for over 35 years. And 2019 is going to be one of the biggest years yet in its record breaking history! Making it a great time to come to London and see Les Miz in all its glory! Since this stunning adaptation of Victor Hugo’s epic masterpiece was first performed in 1985, Les Misérables has been performed in 52 countries, 221 cities and sung in 22 different languages. It has earned itself a unique place in musical history by winning awards all over the world. This includes an unprecedented eight Broadway Tony awards. In 2010, it was performed in three different London theatres simultaneaously. Night after night Les Miserables Theatre Breaks guests are swept away by the power, the passion and the triumph of human spirit of one of the most famous, and well-loved musicals. So I said that 2019 is going to be important for Les Miserables. And amazingly the first bit if news is that it is going to close! Not for good – obviously: there would be a riot! The Queen’s Theatre is going to be closed for 4 months over the summer and autumn of 2019 so it can have some much needed renovation work done to it. The theatre was hit by a bomb in World War 2 and only now have the owners decided to renovate it to its pre-blitz look. As well as work backstage they are also adding more loos for us all, but especially the ladies! So whilst the work is going on, the production that has been at the Queen’s Theatre since 2004, will close down for a few months. Note: * for three performances a week, the role of Jean Valjean will be played by John Owen-Jones. Once the Queen’s Theatre has been renovated a brand new production of Les Miserables, that the creative team are ALREADY starting to work on, will open again at the newly refurbished theatre. More news of THAT soon! So no matter when you come to London you will be able to catch the magic of Les Miserables! Les Miserables Theatre Breaks, including tickets and hotel accomodation continue to be the most popular choice amongst theatregoers to London. Special Offers for the show continue to be the most popular available. Theatre: Queens Theatre, Shaftesbury Avenue, London W1V 8BA. Nearest Tube: Piccadilly Circus on the Piccadilly & Bakerloo lines. Performance Times: Monday to Saturday 19.30; Wednesday & Saturday 14.30. Current Production Booking to: 13th July 2019. Because both theatres hosting Les Miserables in 2019 are on Shaftesbury Avenue, the same hotels are close by for the original production and the concert version! The 3 star St Giles Hotel which is just a 15 minute walk down from Tottenham Court Road and Oxford Circus. The Queen’s Theatre is not that far from Leicester Square Tube station as well as Piccadilly Circus for guests staying outside the West End. For pre-theatre dinner either nip across the road to China Town or behind the theatre into Soho. There is a wide variety of cuisines available in Frith Street and Dean Street, which are my two favourite streets for dining. I am, as people who know me know, completely obsessed with the musical ‘Les Misérables’. Surprisingly, the show received an appalling reception at first, with harsh and condemning reviews from the critics, but today has to be one of the most, if not the most, popular production in London. People have asked me what it is about the show that has made me so obsessed with it, that’s difficult to answer but there is something about Les Misérables – maybe it is the powerful performances, the music, or that moment when a red flag flies on top of a barricade during ‘One Day More’ (which, in my opinion, is undoubtedly the best end-of-act-one number in any musical)… I don’t know, but there is something that is so moving, so powerful, that it makes an impression that is impossible to forget. From the first time I sat and listened to the Complete Symphonic Recording in 1988, Les Miserables grabbed me and has never let go. From the first note to the last it is completely musical, and with no ‘spoken’ conversation it is unlikely to appeal to everybody. Not a day goes by without me listening to at least 6 of the songs from the show, whether it be in my home or car, and I still cannot listen to some of the songs without getting goosebumps (especially ‘One Day More’), or tearing up a little (Empty Chairs At Empty Tables). My recent visit to see Les Miserables was in June, for what would be my 198th time. I watched the show knowing that I would, of course, LOVE every second and it was the first time seeing the show following the cast change. It does have to be said...they were SPECTACULAR!!! Peter Lockyer was simply perfect, and I still maintain he is easily one of THE best 'Valjean's I have seen, only the hardened of hearts couldn't be moved by the passion and emotion in his 'Bring Him Home' and 'The Epilogue'. Jeremy Secomb as 'Javert' was on a par with Phillip Quast in quality of performance, and the power of 'Stars' and 'Javert's Suicide' gave me goosebumps and very teary eyes. Other cast members who certainly deserve a mention, are the fabulous Craig Mather as 'Marius' who, quite frankly, impressed beyond words. David Langham and Katy Secombe who were both seriously (or should that be comically) outstanding as the 'Thenardier's. My love and obsession with Les Miserables will never diminish and I will always believe, and proclaim, it *IS* the greatest Musical EVER. Les Misérables is absolutely stupendous and has now seen by over 70 million people, in 44 different countries. Also, having recently celebrated its 30th anniversary, it is the longest running musical in the West End, with well-deserved standing ovations at every performance. And it’s not difficult to see why. Just take my word for it, go and see Les Misérables at the Queen’s Theatre. Thank you for that superb insight into the show. Les Mis is very lucky to have super fans like you! had,'t seen Les Mis since it left the Palace Theatre way back when. So glad to see that it is just as good now. I saw this 20 odd years ago when (fellow-drama school student) Simon Bowman was playing Marius and now he's the main man singing his heart out as Jean Valjean. And what a richly beautiful singing voice it is too! Equally, gobsmackingly brilliant is the superb bass baritone vocals of Hans-Peter Janssens (Javert) moving me to tears with the soaring power of "Stars". Obviously over the years, bits have been added on and taken away to keep the production fresh. Some of the additions weren't, in my opinion, entirely necessary and made the first half extremely long - especially for my 8 year old son who got the wriggles between "Stars" and "One Day More". However, he was extremely pleased that Epinine showed a good splattering of blood across her chest in the 2nd half and that Enjolras had the obligatory musket wound at the end of the Baricade scene. A favourite with both my children was, of course, Gavroche, who sported an uncanny likeness to a colleague's 12 yr old son which made him all the more apealling. My son even gave him a standing ovation when he came to take his bow. and I would highly recommend it to all theatre lovers and even those who are taking the first steps into the exillerating world of musicals. You can not go wrong with Les Miserables. 5 stars! We say: Another favourite show – the music, the story, the set, the costumes, the singing, the orchestra – I like it when you can see where your money has been spent when I visit a London theatre. There is a reason why this show has been playing in London for 35 years – and that is because it is universally loved. 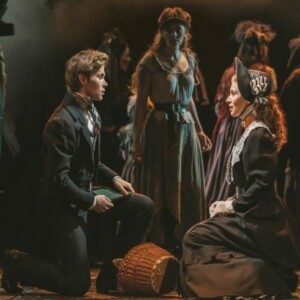 Go on, fall in love with Les Miserables… but take a hanky!